Tusk is an unofficial, featureful, open source, community-driven, free Evernote app used by people in more than 140 countries. Come over to Gitter or Twitter to share your thoughts on the project. Visit the contributing guidelines to learn more on how to translate this document into more languages. You can find more apps here. Head to the releases page and download the appropriate installer for your system. The version available on Homebrew Cask or AUR may not be the latest. If that is the case, please consider downloading directly from the Github releases page. Visit the project homepage to view all features in detail. Auto Night Mode - Press Cmd/Ctrl Alt N to allow Tusk to adjust to your environment. 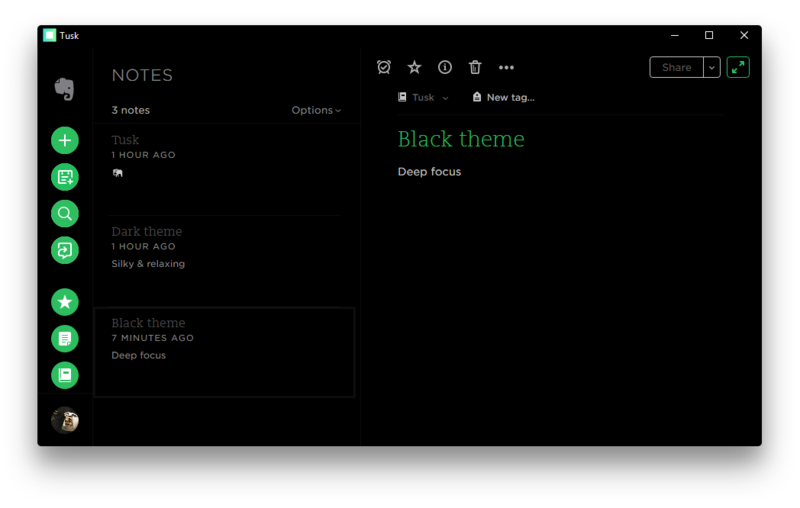 Black Theme - Activate it by pressing Cmd/Ctrl Alt E.
Compact Mode - Downsize the window to enter the mode. Custom Shortcut Keys - Navigate to ~/.tusk.json or press Cmd/Ctrl . to modify any shortcut key. To reset delete ~/.tusk.json & restart the app. 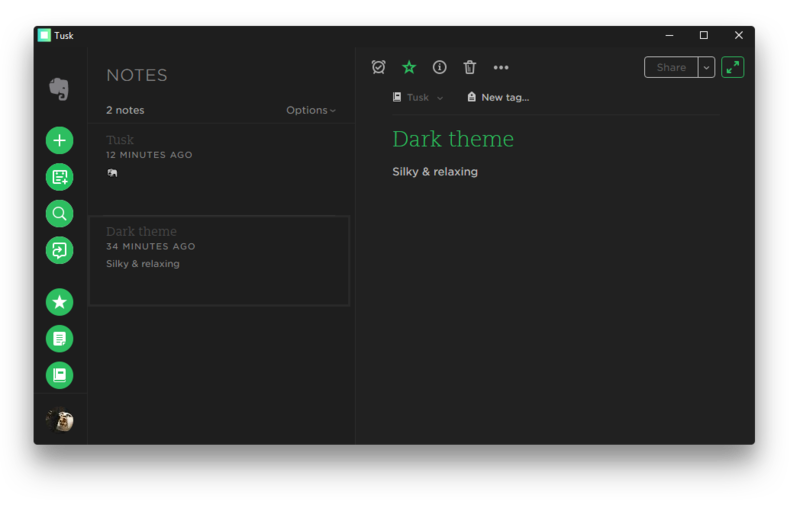 Dark Theme - Activate it by pressing Cmd/Ctrl D.
Drag & Drop Files - Attach files by dragging them to the app window. Export Notes as Markdown - Press Cmd/Ctrl O to save your notes as Markdown files. Export Notes as HTML - Press Cmd/Ctrl Shift H to save your notes as HTML files. Export Notes as PDF - Press Cmd/Ctrl Shift E to save your notes as PDF files. Focus Mode - Activate it by pressing Cmd/Ctrl K.
Global Shortcut Keys - Enable them by using the File > Enable Global Shortcut Keys option. Note Navigation - Navigate your notes by pressing Cmd/Ctrl Tab / Cmd/Ctrl Shift Tab or jump directly to one by using Cmd/Ctrl 1 - 9. Note Printing - Press Cmd/Ctrl Alt P to print your notes. Scalable Interface - Adjust the zooming factor by pressing Cmd/Ctrl Shift = or Cmd/Ctrl -. Sepia Theme - Activate it by pressing Cmd/Ctrl G.
Update Notifications - Customize the apps update checking frequency. Yinxiang Support - Login to Yinxiang by using the File > Switch to Yinxiang option. 70+ local keyboard shortcuts. Toggle anything in a flash. View all the available local keyboard shortcuts. Bulleted List Cmd/Ctrl Shift . Edit Shortcut Keys Cmd/Ctrl . Access Tusk at any moment from anywhere within your operating system. All global shortcuts can be customized to match your own preference through the configuration file ~/.tusk.json. View all the available global keyboard shortcuts. For more info on how to contribute to the project, please read the contributing guidelines. Ao - Elegant Microsoft To-Do desktop app. Taskbook - Tasks, boards & notes for the command-line habitat. Tusk is an unofficial, open source, third-party, community-driven, free app and is not affiliated in any way with Evernote.